GO Transit is a regional transportation system consisting of buses and trains, with multiple stations in Toronto. A GO Transit GO Transit ticket can get you on one of the GO Trains or buses that connect Toronto with the Greater Toronto Area and Hamilton. 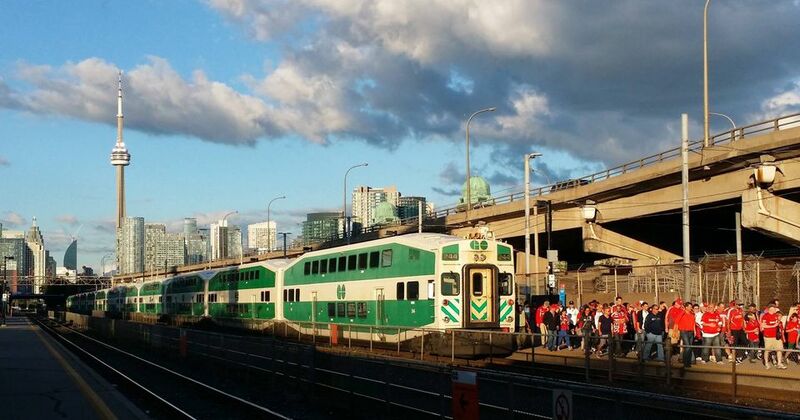 GO makes for a convenient way to get around the GTA for both commuters and leisure travelers. Unlike the TTC and most of the other public transit systems in the GTA, there's no one price for a GO Transit ticket. Instead, the price of your ticket is determined using a "fare zone" system, meaning how much you pay is based on where you'll be traveling. There are also different rates for adults, seniors, children, and students. In terms of costs and fare zones, if you're starting your journey at Union Station in downtown Toronto and want to ride just one stop on the Lakeshore East line to the Danforth GO Station (for example), that would cost an adult $5.65 and a senior $2.85. But taking the train all the way east to Oshawa would cost the adult $10.85 and the senior $5.45 (at the time of writing - prices subject to change). If you use a PRESTO Card, you'll automatically receive an incrementally-increasing discount based on how many trips you take in a month. This is a great option for commuters who make the same trip every weekday (GO Transit used to offer discounted 10-ride paper tickets as well, but they were discontinued in August 2012 in favor of the PRESTO system). Even if you won't be traveling as frequently as daily commuters, using PRESTO can still result in a discount and can be easier for some people than dealing with paper tickets and passes. Group passes are also available. Visit the GO Transit website and use the fare calculator to get an estimated cost for your particular trip. GO Transit tickets can be purchased from attendants at all GO Train Stations and GO Bus Terminals during ticket booth hours (which vary by station). Many stations also offer automated ticket sale kiosks. If you'll be riding a GO bus rather than a train, you can choose to buy single-ride tickets, day passes or group passes from the driver. The PRESTO Card is an electronic card that you load with funds. You can purchase a PRESTO Card from Union Station, GO Train stations and some other GO agencies. You can also purchase a PRESTO Card online, and set it up so it automatically reads reloads. There is a $6 issuance fee and you'll need to load the card with a minimum of $10. If you're riding on a GO Bus and have bought a ticket in advance (from a booth attendant or machine), you'll need to show it to the driver as you board the bus. If you're using the PRESTO Card, you'll need to tap on at the reader located beside the driver AND tap off as you exit at your stop. If you're riding on a GO Train, you won't show your ticket to anyone as you board. However, if you're using a PRESTO Card, you do need to "tap on" at a reader at the station before you enter the fare paid zone (and "tap off" at the station where you exit). GO Trains run on a proof-of-payment system, where you board at any door and keep your ticket or PRESTO Card handy, as a GO Transit enforcement officer, customer attendant or other GO Transit employee could ask to see it at any point. If you have a ticket or group pass, they'll check that you're somewhere between the fare paid zones listed on it, and if you're using a PRESTO Card the enforcement officer will use a scanner to make sure you tapped on before boarding. Visit the GO Transit website for the fare calculator, to check the booth hours of the GO Transit ticket agency nearest you, check for service updates, or plan your route.